Indie studio Phantom Compass developing. Atlus’ unannounced PlayStation 4, PS Vita, and PC third-party title teased yesterday is Rollers of the Realm, pinball RPG hybrid game. In development at Phantom Compass, the game is due out this holiday season as a download-only title. 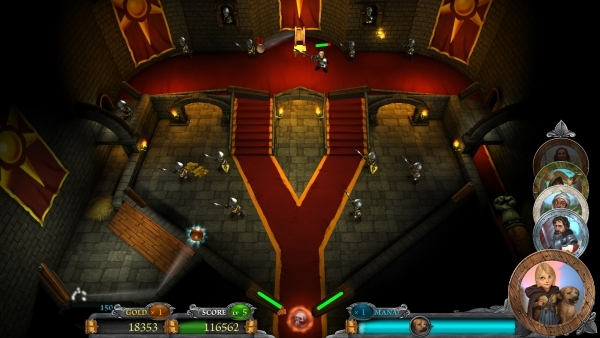 Rollers of the Realm replaces static pinball tables with dynamic locations containing objectives, secrets, and multiple areas. Standard bumpers are AI-controlled enemies who can attack and damage the pinball flippers. Pinballs become playable characters, each with different attributes, special abilities, and physics. The game’s story offers six chapters, where players will have to master each pinball’s strengths and weaknesses. Characters will each have their own backstories and personal agendies, which are told through voiced-acted cinematic and dialogue scenes. New characters with new abilities can also be unlocked. Through the game’s item shop, players can purchase upgrades to help defeat some of the game’s more difficult bosses. Rollers of the Realm will be playable at E3 next week. View the first screenshots at the gallery.